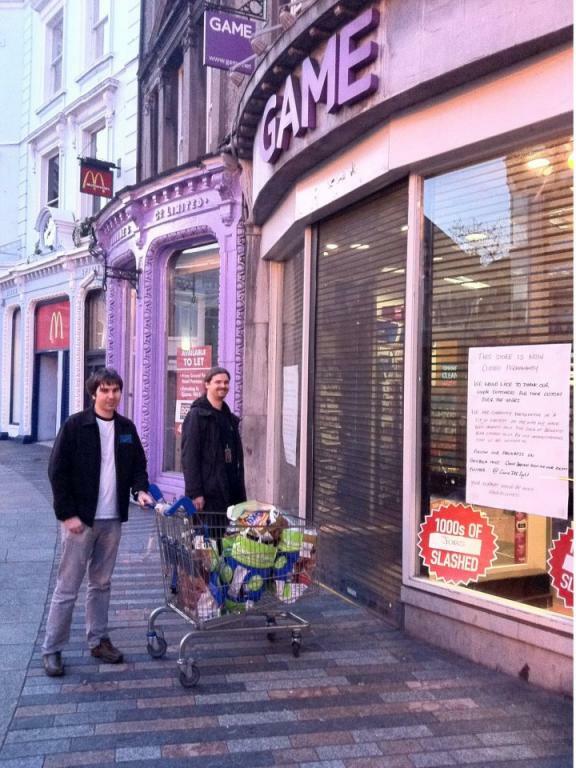 Former staff at closed Game stores in Ireland have occupied their workplaces to demand redundancy payouts. All the stores in the south of Ireland have been occupied, after staff at the Limerick store began a sit-in. The company has closed all of its Irish stores and a large number of UK outlets, with staff working right up until the lunchtime notice to cease trading arrived. According to James Daly, a spokesman for the workers in Cork, administrators brought in from PricewaterhouseCoopers have flouted Irish employment law by not giving the required 30 days notice for collective redundancies. 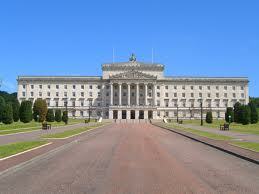 Quoted by the Belfast Telegraph, he said, “They just assume the law is the same as the UK. We were told ‘Go to the Government and claim your statutory redundancy’. That could take up to a year or 18 months to go through while Game is still trading in the UK. A packed public meeting, which was conducted bilingually, was held in Dublin on Sunday 25th March, where demands were made for the immediate release of Republican prisoner Marian Price. 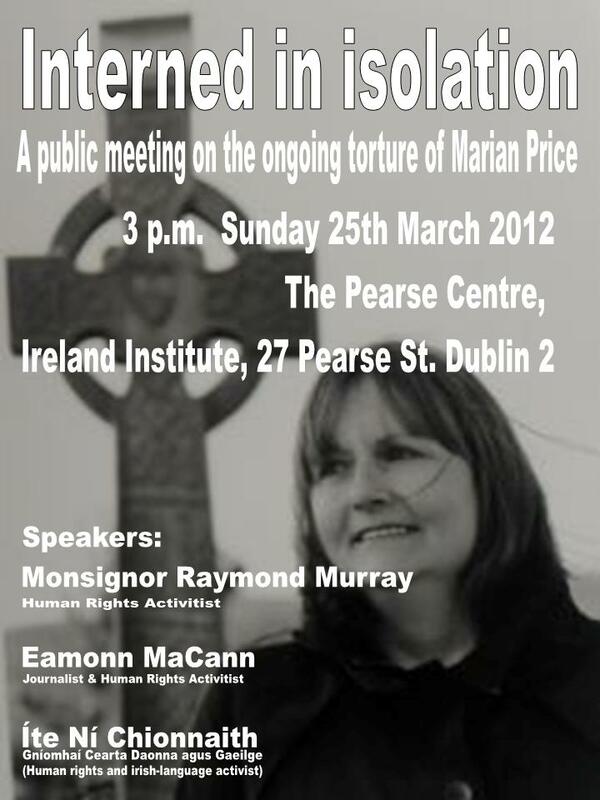 “Internment and torture” were the terms used by the first speaker, Monsignor Raymond Murray, in describing Marian Price’s imprisonment, and he named Secretary of State, Owen Patterson, as responsible. The chairperson of the meeting, Íte Ní Chionnaith, agreed strongly with the points made that it was unjust, illegal and inhuman to keep Marian Price in prison, given her illness. Two friends of Marian’s spoke, themselves ex-prisoners, Nuala Perry and Eibhlín Collins, asking that the campaign for Marian’s freedom be broadened, and they gave an account of her present suffering and the injustice surrounding her imprisonment. The new northern state: a stable solution? The article below is reprinted from the March/April 2012 issue of Socialist Democracy’s bulletin: available here. There are a couple of other very good articles in it, so do go and read it. I’ll be posting a couple more pieces from it here and it would be good to get some discussion going, as there isn’t a mechanism on their site for discussion. Although I think the article below is very good, one thing I disagree with is the silly pretence by SD that the gas-and-water socialists, who basically collude in partition, are “the socialist movement” in the north, while the clearly anti-capitalist organisation éirígí is merely republican. I can appreciate that SD was suspicious of éirígí at first, but it should be very clear by now that this is a militant, socialist-republican organisation with far better politics than the twenty-first century Walkerites who SD refer to as “the socialist movement” in the six counties. 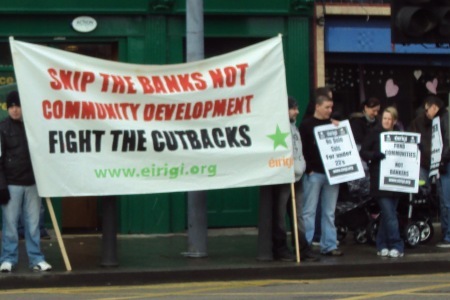 The 2011 elections in the North of Ireland marked a substantial victory for capitalism. It marked the first point where one Stormont administration morphed to another via election without the collapse of the government. Dublin’s National Stadium was packed to capacity earlier today as the Campaign Against Household and Water Taxes held its final major rally ahead of the March 31 deadline for payment of Phil Hogan’s hated poll tax. 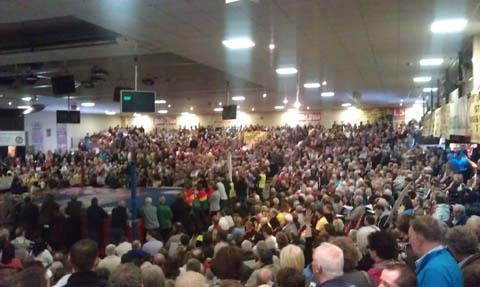 In excess of three thousand people descended on the south Dublin venue, with hundreds having to stand outside as there wasn’t even standing room left within. From noon it was clear that the rally was going to be a huge success as buses from all corners of the state started to arrive. As the crowds continued to swell a near carnival-like atmosphere developed with rounds of applause greeting blocks of new arrivals. When several hundred protesters from the surrounding communities marched up the South Circular Road the response of the crowd was as spontaneous as it was loud. 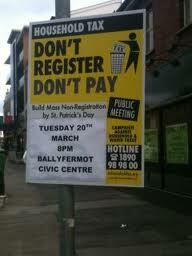 The Dublin government has set midnight on March 31 as the deadline for payment of its noxious ‘household charge’. Homeowners who fail to pay the €100 poll tax by then will find themselves liable for additional incremental ‘penalties’ and ‘interest’ rising to a total of €42 over the course of the following twelve months. Those who don’t register by March 31 are liable to prosecution in court where a guilty verdict could result in a €2500 fine. And so with their deadlines and their threats of penalties, fines and jail, the Dublin government hopes to implement the dictates of their overlords in the Troika. They publicly calculated the hundreds of millions of euros the home tax would raise for the bailout of the private banks. In their arrogance they had even begun to prepare the ground for future property and water taxes that would squeeze more than €1000 per year from virtually every family in the state. On Monday evening March 12, up to 100 people, including a number of local éirigí members and supporters, attended a public meeting of the campaign in the Ballyfermot Civic Centre. 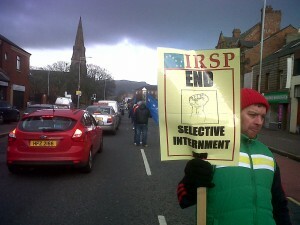 The crowd consisted of local residents, trade unionists and representatives of local community and voluntary services. A number of political parties were also in attendance, including éirígí, the United Left Alliance, the Workers Party, and Sinn Féin. This is a very important dispute and part of the reason I haven’t been posting much here over the past fortnight or so, other than some reprinted material from other sites. The other blog I’m involved in, the NZ-based Redline, has about two dozen pieces on the Auckland wharfies’ resistance to the Port company’s attempt to smash their union and casualise waterfront labour. Check out here. I’m expecting, however, that normal transmission will resume on this blog next week.